We’re back in Grenada from a week away in Chicago. This was our first time in the mid-west city and honestly, we felt like it was a very approachable, welcoming, livable big city. Our first impressions of Chicago were extremely positive and as the week continued on, those feelings remained. In fact, the city totally grew on us and by the end of our visit, we’re pretty sure it’s our new favourite city in the US. There are so many things to do in Chicago, we could’ve spent a month and not even scratched the surface. 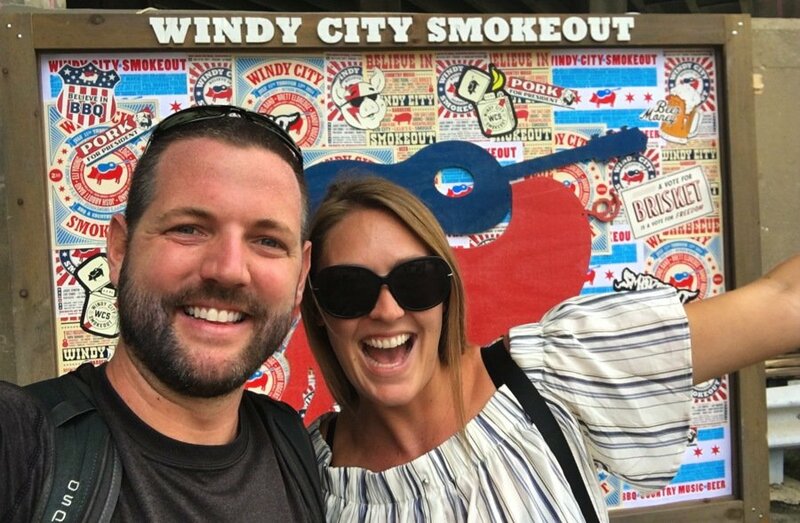 Don’t miss the video at the end of this post which shows you what our week in Chicago was like and all the things you can see and do there! The reason we went to Chicago was because we were invited by Choose Chicago, which is the city’s tourism board. Why would they want to invite us? How does a relationship with a tourism board and bloggers work? 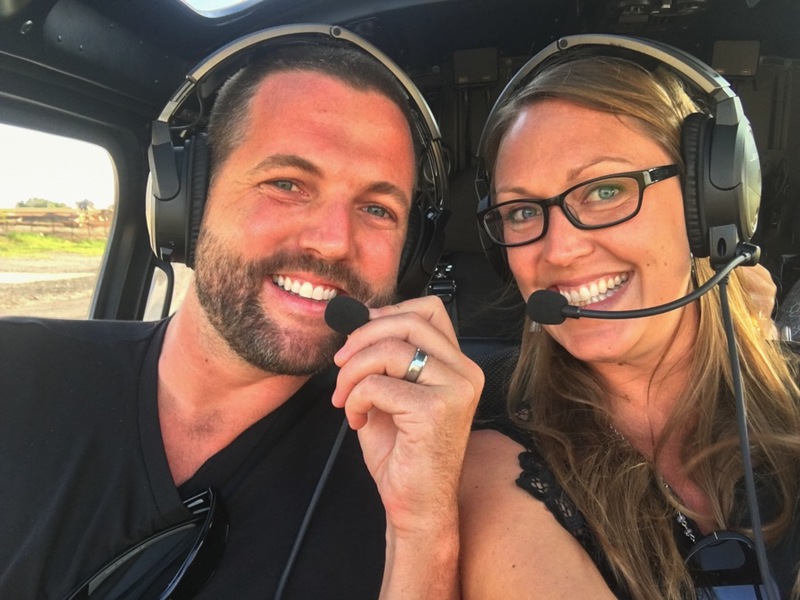 How do we get paid to travel? These are questions that we’re constantly asked by readers, and rightfully so. 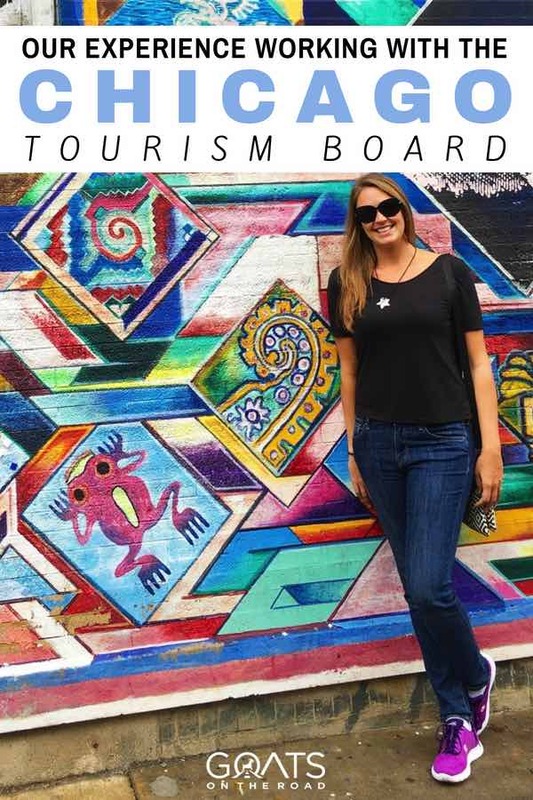 Press trips and blogger fam trips are still a relatively new and exciting thing, so in this post, I hope to answer those questions, as well as give you a glimpse of what our trip was like working with a tourism board. Because of the readers on this blog, viewers of our YouTube and social media followers (thank-you so much! ), our website has grown to be one of the Top 50 Travel Blogs​ based on website traffic. We currently just under 200,000 people visiting our site each month to read the articles we post. For our social media accounts, we have a combined following of around 180,000. Because of these stats and the relationship we’ve formed with our readers through blog posts, videos and social media – brands and companies want to work with us to have us promote them. Press trips like this have been going on for decades, but pre-.com they were reserved for members of traditional media like magazines, newspapers and travel tv shows. These days, with the growth of social media and blogs, companies have realized that they can get even more exposure through personal brands like those run by travel bloggers and Instagrammers. A magazine talks at you, while a blogger talks to you and forms a conversation with you through comments, emails and shares. Now the companies can get exact stats of who is seeing the promotions, who liked it, what they said about it and even if they end up booking a trip. It’s a great way for tourism boards and travel brands to see immediate and trackable ROI (Return On Investment). Want to work with brands and travel for free? 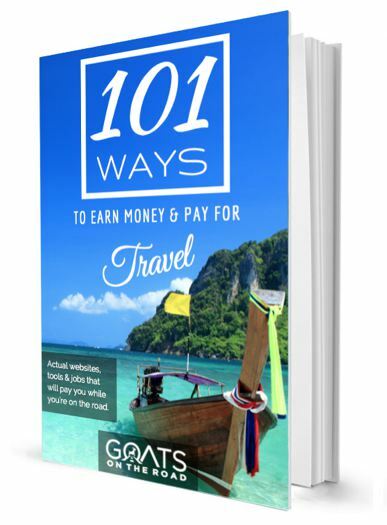 Click Here to learn how to start a travel blog in just 10 minutes plus get our beginner blogger course for free. In the case of Chicago, we were there to show you what it would be like to travel to this American city. We were treated like royalty and it was one of the best campaigns we’ve ever done with a tourism board (we’ve done many including Indonesia, Argentina, Greece, Kyrgyzstan, Malta & New York). We felt really appreciated as bloggers, which is a wonderful feeling. We’ve worked really hard to get to this place, and it’s nice when the hotels, tour companies and tourism boards we work with show us that they value our work! Communication between all of the marketing reps was great and the itinerary was on point. 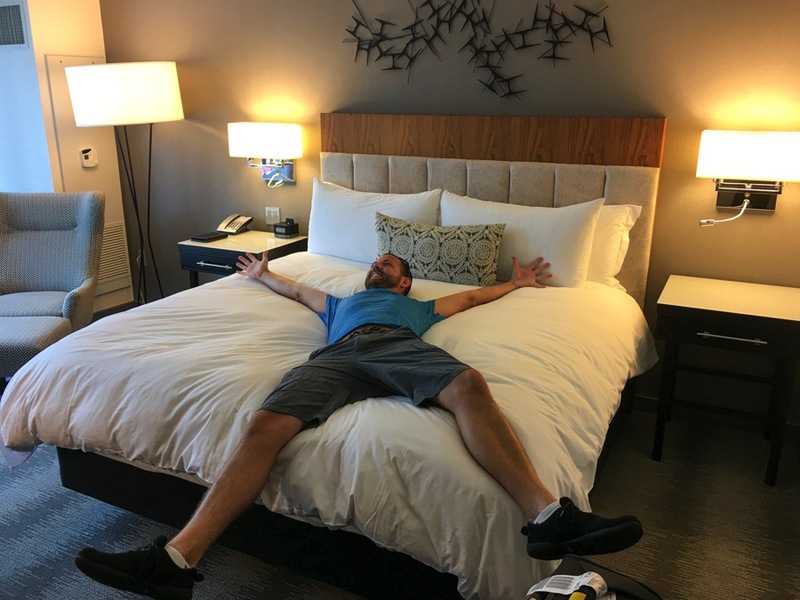 We stayed at the Loews Hotel and enjoyed all of the city’s top attractions (including the Chicago Architecture River Cruise), dined at the best places to eat in Chicago, and drank at some of the best bars in Chicago! Thankfully, we had many hours each day that were considered “free time” for us to just explore on our own. 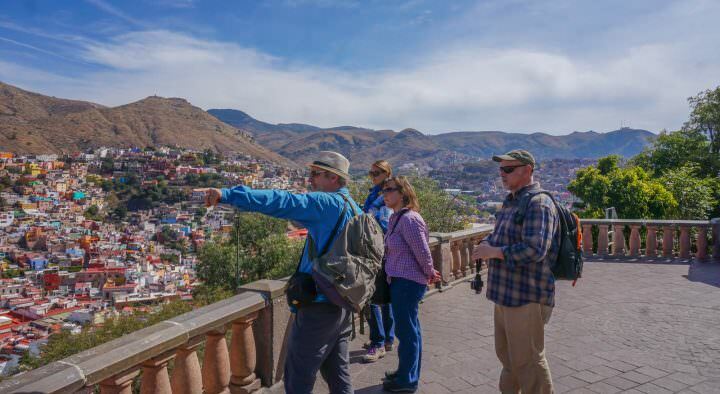 During trips like these, all transportation, accommodation, food and activities are included and we are also paid a fee for creating content during and after the trip (content being YouTube videos, articles on our website and social media shares). 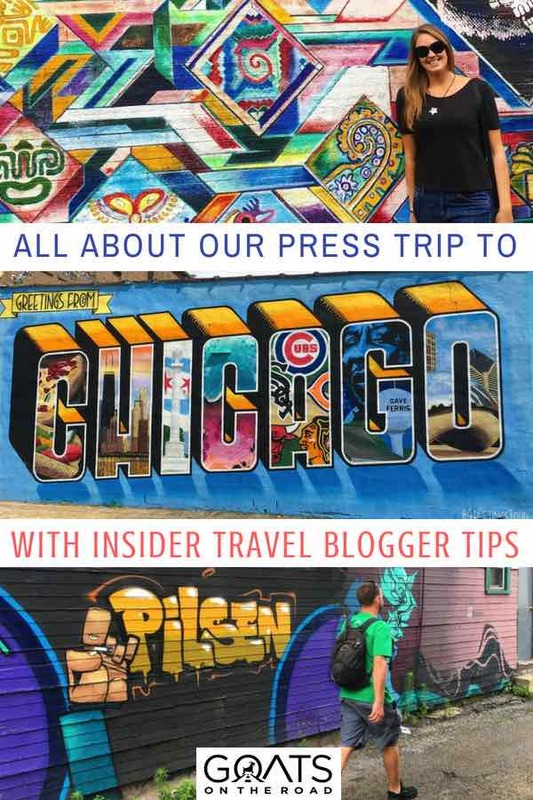 We only agree to attend trips that we know will jive with us, our brand, and our readers…and Chicago 100% did! Upon checking into the Loews Hotel, we found 2 bags of swag sitting on the bed. We love getting gifts on these types of trips (who doesn’t love a good swag bag?) 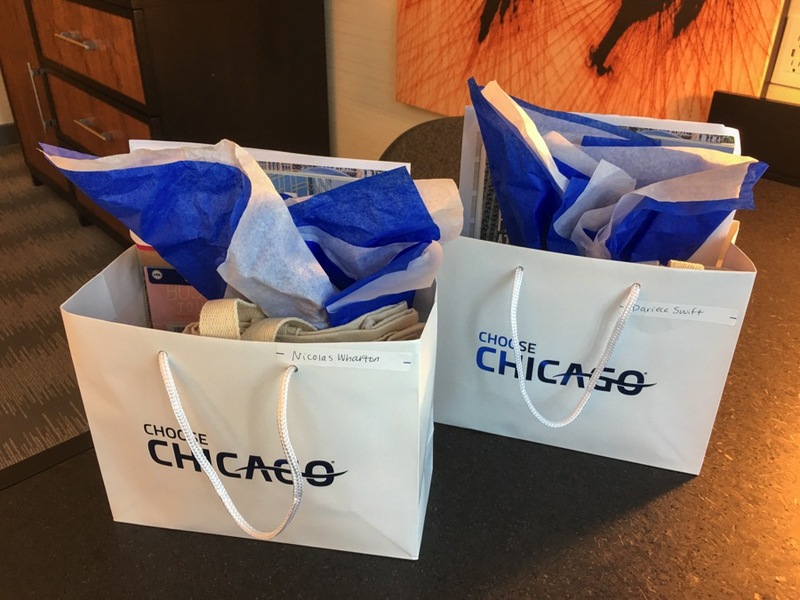 and these welcome bags were full of tasty Chicago treats, city passes, gift cards and maps as well as a printed itinerary of what was planned for our visit to Chicago. What a great way to arrive in the city. 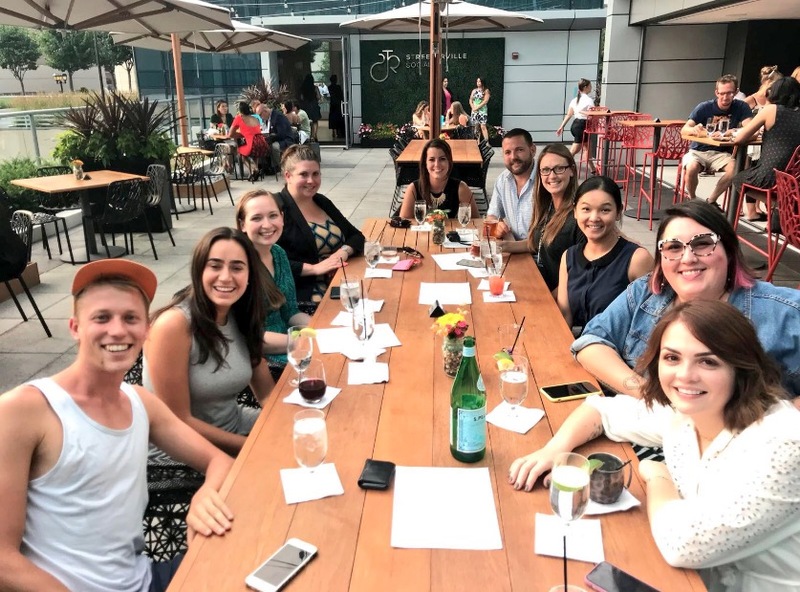 Shortly after checking in, we went down to the hotel lobby to meet up with the Choose Chicago and Loews Marketing reps and the other bloggers/vloggers/social media influencers on the trip. Luckily everyone was really cool and we all got along right away. We were to spend the next 5 days together, so if we didn’t jive, it wouldn’t have been such a great trip! Every day we had amazing activities planned, but we had some definite highlights. The helicopter ride over the city with Chicago Helicopter Experience, the shopping spree at Macy’s, the Windy City Smokeout and Taste of Chicago food festivals and the Skydeck at Willis Tower were definitely our favourite things that we did with Choose Chicago, but we also loved exploring the many neigbourhoods of the city on our own. We spent time walking around Pilsen, Bucktown, The Loop, Fulton Market, River North, The Navy Pier and so much more. 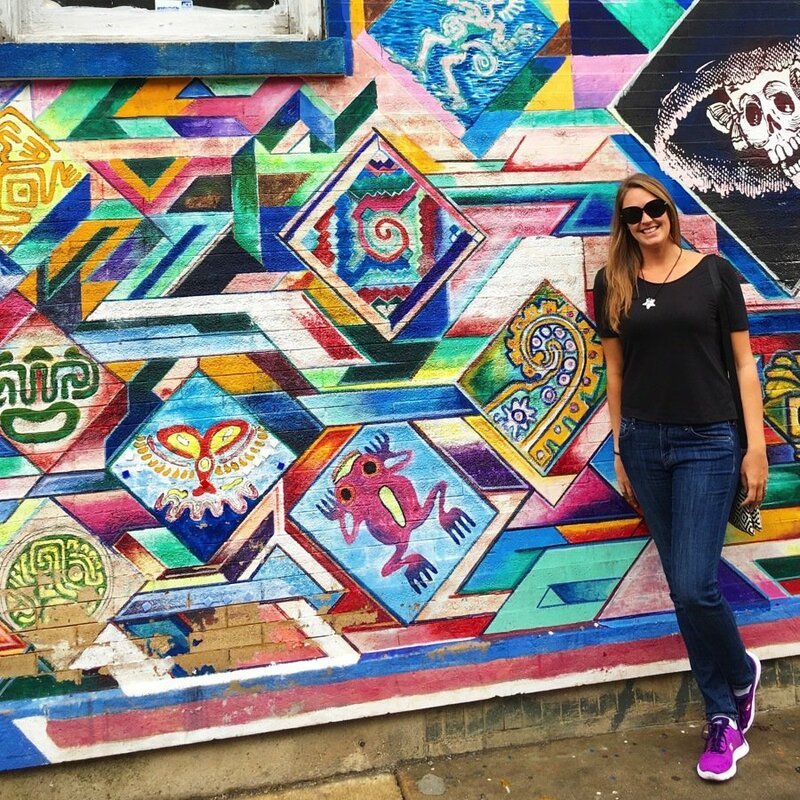 Chicago is home to 77 unique and exciting neighbourhoods and we were only able to visit a few in our short visit, but we definitely want to come back and see more. When we were working on this trip, we were mostly recording clips for a few YouTube videos that we’ll be producing (the first one is at the bottom of this post), as well as doing Instagram Stories and taking notes about the places we visited so that we could write about it on the blog later (there will be plenty of Chicago posts coming up so stay tuned). Even though it was a super busy trip and we were pretty much non-stop exploring, eating, partying and working from nine in the morning until nine at night or later, we still had a blast the entire time. We never felt pressured to create a specific type of content and Choose Chicago was great at allowing us to have our own creative freedom while producing the videos and posts (we wouldn’t have it any other way). 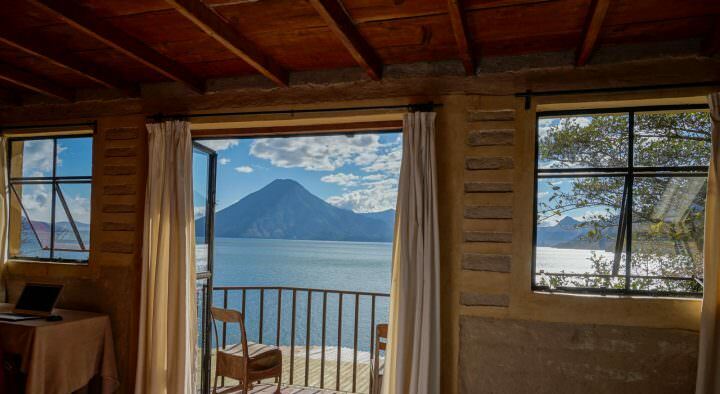 This is just another reason why we love this job of travel blogging. Before 2012 and before we started this blog, we would’ve never dreamed that one day we’d be hired by an American city to come and have unforgettable experiences like this. It really is a dream come true and we thank you for your continued support and for helping us get to this point. 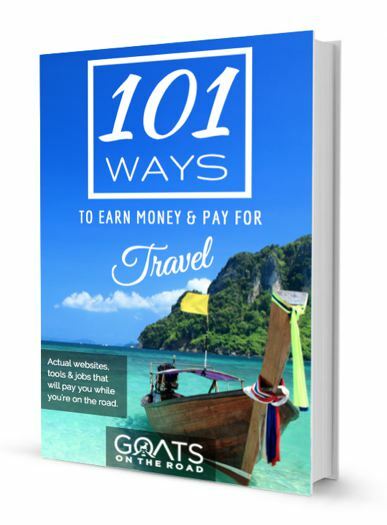 We’ll continue to do our best to share with you what it’s like to be a digital nomad and how you too can earn money online and on the road so that you can travel for as long as you want. All in all this will go down as one of the best press trips we’ve ever done and we definitely want to return to Chicago again one day soon. Whether it’s with Choose Chicago again or not, our plan is to go back to the Windy City and explore some more off-track places and hidden neigbourhoods. Chicago has so much to offer. As always, all of our thoughts and opinions on social media, our YouTube Channel and on this blog will remain 100% honest, no matter what we are comped. We have never accepted a trip or paid job where we were told to write / act a certain way, and we’ll continue this way moving forward. Being invited on a trip to do exactly what we love – travel and share it – is a win-win for everyone. It helps to keep the blog running and it helps us to produce useful content to share across our channels. 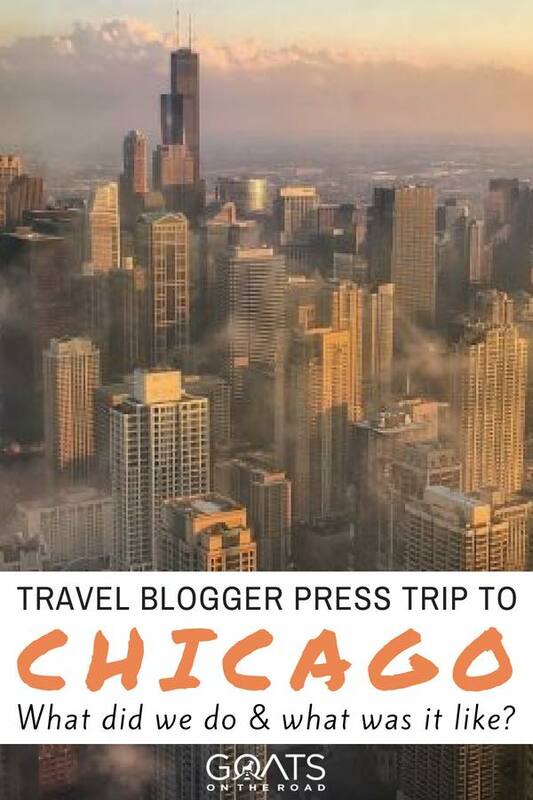 If you haven’t been to Chicago yet… plan a trip! It is a fun, energetic, unpretentious and approachable city that won’t disappoint. I have literally just finished editing and uploading our first video for Chicago to YouTube! 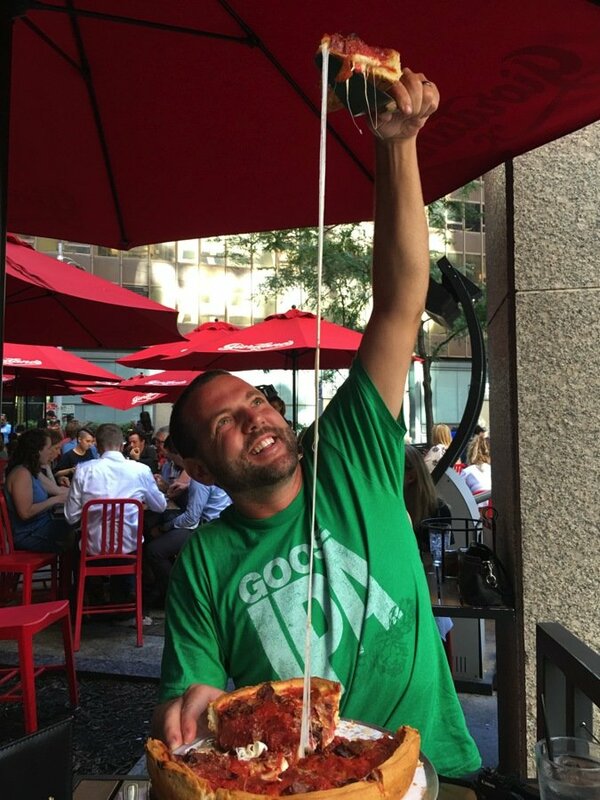 Check it out below to see all of the fun things to see, do and eat in just a week in Chicago. That’s right… GoatLife TV is back!! If you like the video, please click here to give it a “thumbs up” and leave a comment  Thank you so much for your support! 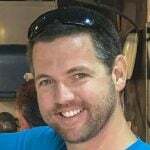 Nice blog – great video! I’ve missed Goat LifeTV. Your Chicago episode was so good. The Tourism folks should love you guys. They certainly got their money’s worth. Maybe you could get Vernon tourism to sponsor a trip here! Thanks so much for watching, reading and commenting Charlie We had such a great time in Chicago! Thanks for reading and commenting Tara! 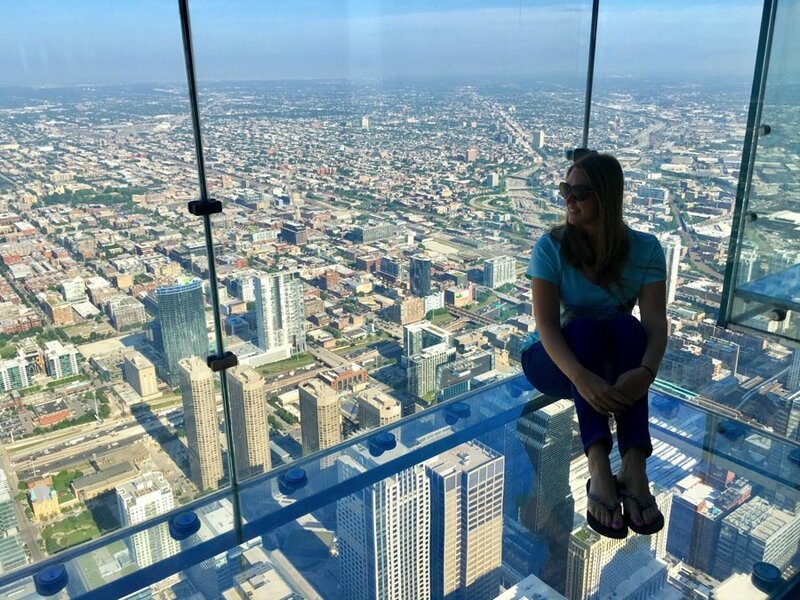 Yes, Chicago is such an amazing city – a place we’ve always wanted to visit and it didn’t disappoint I’m about to hit publish on a Things To Do in Chicago article, check it out! Happy travels. Chicago is such a great place.Video is very awesome. You did an awesome job of showcasing many of Chicago’s best attractions. I’m glad you such a great time and perfect weather. Sorry we missed you since we were only there for one day this trip. Your video makes me proud of my hometown. Thanks for sharing! !